Having years of experience in app development, Agile Infoways is delivering the top class solutions for app development as per user needs. Our developers are so talented to work on any kind of Mobile App Development for Event Booking. We have all the skills to provide you customized event application as per your requirements. Do you want Mobile App for Event Business Solution? We are here to serve you with the best Event booking application Android, iPhone services. Each event needs a decent application – regardless of what the size, regardless of what your financial plan. 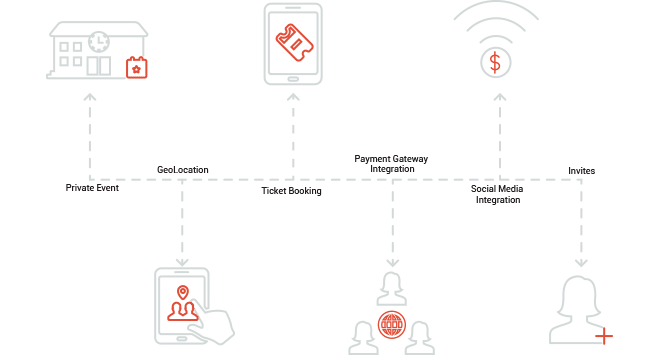 Make an event application and convey the power of the world’s most effective event application platform to your conference, celebration or meeting. Agile Infoways offer a feature-rich Event service application to participants at event of any size. Web app development for Event Booking should get done only from the most famous and leading Mobile App Development Company. Discover upcoming local events and activities in your city, find events by category and browse trending events happening every day. It will show list of nearby events. All Events are listed and user can filters by today, tomorrow etc. User can see all Events as a marker on one Map. User can navigate by Map. User will be able to filter events by categories and dates and also be able to search event by name. It will show detail of the event like photos, organization, location. User will be able to select tickets, show comments and share event. User will be able to add his payment card details and pay using credit card. Secure algorithms are used for store payment details. User will be able to see list of attendees and also communicate with the organization. User will be able to buy multiple tickets for him or for his friends or family members. User will be able to share tickets to his friends or family members after purchase or during purchase. Event Manager for Organizers is an awesome tool for any event organizer who wants to manage their events easily and attendees on the go. It will show list of upcoming and past event of the organization. User will be able to track sales with filter options. User can also tickets sold, check-ins and attendees. User will be able to view attendees and check details of the attendee like ticket number, status, purchased by, etc. User will be able to scan tickets. User will be able to send event related message to all attendees. Sell tickets from your website with the help of our embed widget & share your event without difficulty on popular social networks. Event Manager can promote event, so that will reach to more people. If you had already purchased tickets for an event, you can simply transfer them to a friend. You can find friends or you can type in your friend’s email address and click Send. Do you have several email accounts? The general problem we have faced in entering an incorrect email addresses or forgetting which of their email addresses was used during purchasing, so make sure to check any other email accounts you may have used. How to Manage Ticket Orders? By using the Ticket Orders feature, you can accept offline payments while providing an electronic Ticket. You can collect this information alongside your online sales and keep track of payments.